Extensively renovated Victorian property in tree lined Regents Place, a conservation area within the commercial district of Rugby town centre. This prestigious address houses eight individual office suites that share a smart entrance hall, attractive kitchen, meeting room, landscaped courtyard and luxury washrooms. Business, leisure, retail facilities and railway station are all within a few minutes’ walk with plenty of on-street and long stay car parking nearby. Fully furnished business centre with flexible terms available, formally a Victorian School. Services include meeting room access, secretarial services, broadband, network and 24 hour access as well as onsite car parking. 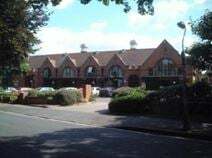 Located to the east of Rugby town centre and within easy walking distance to the railway station and shopping centres.